Moloch, or Molech, is well known in the Bible for being the god to whom child sacrifices appear to have been made in a shrine outside the city of Jerusalem. Although Moloch is well known in the Bible, he is less well-known in the archaeological and historical records leading to disagreements over the identity of the god as well as the exact nature of the cult of Moloch. The name “Molech” or “Moloch” most likely comes from the Hebrew word Melekh, meaning king. For a long time, it was believed that Moloch was another name for Milcom, the chief deity of the Ammonites, but this view has fallen out of favor because of more recent research. 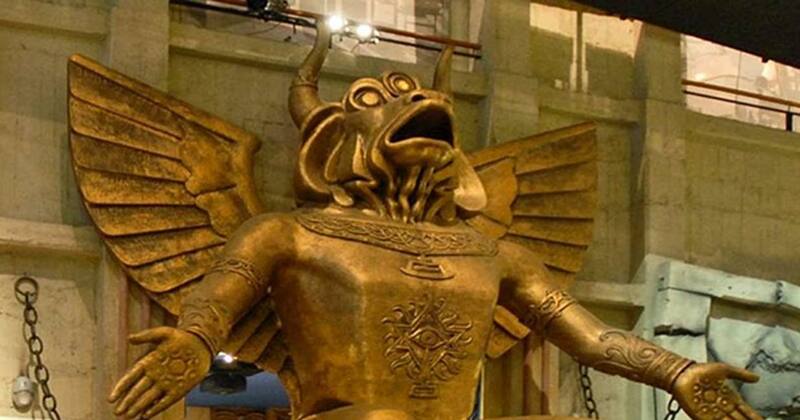 Moloch – followers sacrificed children to the idol. Source: Jonund / Public Domain . 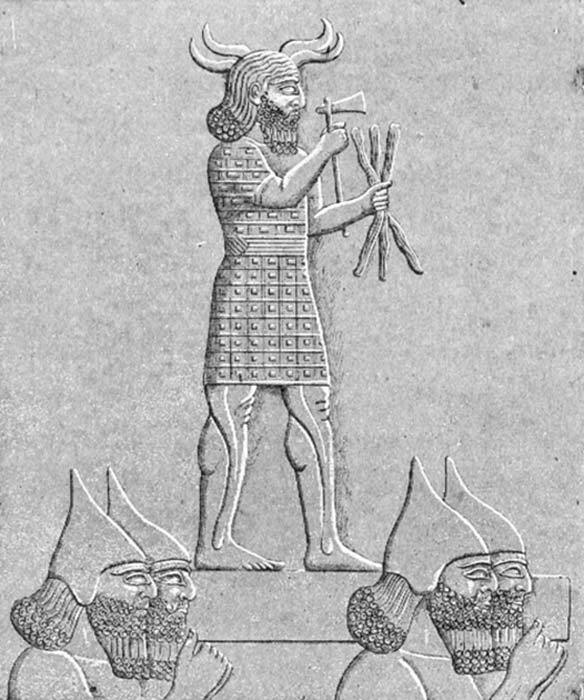 One suggested identity for Molech is the Canaanite deity, Ba’al-Hadad or Hadad. Hadad was considered the king of the gods by the ancient Canaanites. Evidence that Moloch can be identified with him comes from the fact that the pagan alters in the valley of Ben-Hinnom where children were sacrificed are also described as altars to Ba’al by the prophet Jeremiah. Furthermore, Assyrian texts state that child sacrifices were made to Adad, the Assyrian equivalent of the Canaanite Hadad. This makes it reasonable to suggest that child sacrifices may have also been made to Hadad and that a cult of child sacrifice may have been related to him. In the Biblical account, children are said to have been sacrificed or “passed through the fire” to Moloch at a shrine outside the city walls of Jerusalem called Topheth, in the valley of Ben-Hinnom. Although it is most likely that this practice was due to the introduction of a foreign deity, it has also been suggested that the Judahites believed that that they were making sacrifices to Yahweh, the national deity of the ancient Judahites and Israelites. Either way, the prophets harshly condemn this practice as being offensive to Yahweh whether it be a corruption of Yahweh worship or worship of a foreign deity such as Ba’al-Hadad. The practice of child sacrifice is attested in other sources throughout the ancient Mediterranean world, particularly in Carthage. In the city, a sacred grove and a temple were dedicated to one such cult. Carthage was founded by Phoenician colonists which gives them a connection to the Canaanites. It has been suggested that there is also a connection between the child sacrifices practiced in Carthage and similar practices in Canaan and Judah such as the cult of Moloch. 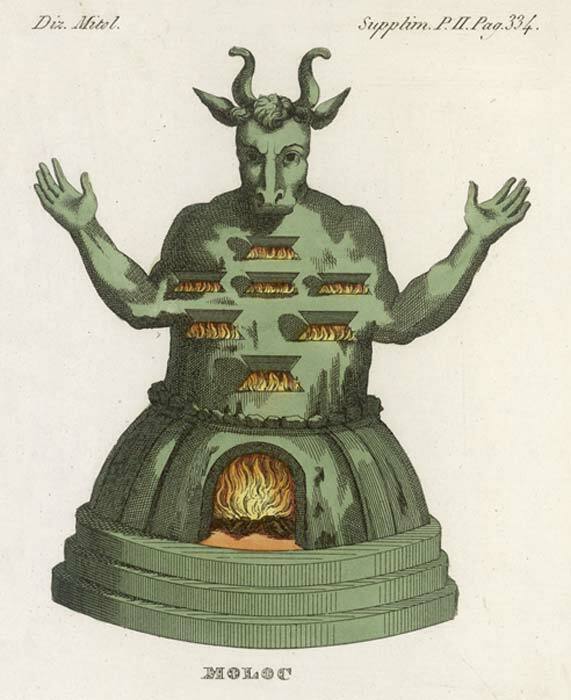 Some scholars dispute this suggestion saying that the Carthaginian practices differed from the cult of Moloch. It is commonly believed that child sacrifice at Carthage was usually only done during times of extreme crisis, in accordance with Classical sources, whereas child sacrifice is said to have been a regular part of the cult of Moloch. On the other hand, it is isn’t necessarily clear from the Biblical text that child sacrifice was as regular as it has been suggested in the cult of Moloch. The cult of Moloch may also have only involved sacrifice of children in times of crisis, or it may have occurred only on special occasions such as annual festivals or at the birth of a first-born child. These practices are attested in other parts of the ancient Mediterranean. As a result, there isn’t necessarily a reason to think that one cult involved regular sacrifices while the other one did not. Another major point of contention in the study of Moloch is whether or not children were sacrificed at all. Some scholars as well as ancient Rabbis have suggested that “pass through the fire” meant passing between rows of fire in an initiation rite. In this view, the “abomination of Moloch” condemned by the Hebrew prophets was Jewish children being initiated into paganism. Thus, children were not actually sacrificed at all and it was the initiation ceremony that alarmed the prophets. There are some problems with this view, however. Although there are some cases where the text could be referring to something like this initiation rite, there are also cases where passing through fire is clearly referring to burning. Furthermore, ancient Near Eastern texts give good reason to believe that actual child sacrifice occurred. There is a lot of uncertainty regarding Moloch, though a few things can be said with relative confidence. It is clear from Biblical and ancient Near Eastern sources that Moloch was probably a title or epithet used for a prominent Canaanite deity to whom children were at least occasionally sacrificed. This deity was either a foreign deity or he may have been a mischaracterization of Yahweh himself, though this is one of the less likely explanations. Beyond this, there is still much to learn. As the commenter above mentioned, Ba'al just means lord, and there were multiple Ba'als. In fact, the Ba'al whose servants Elijah in the Bible might not have been Ba'al Hadad, Quarnaim or Hamon, but might have been Melqart, who is also Heracles/Hercules. I could see Molech being a title like Ba'al, but its my understanding the "king" of the Canaanite gods was "El" (not Yahweh though). More interesting is the Bull or horns Symbolism, As many gods share this. In Revelations, it says that Pergamon has Satans Throne, which was the Altar of Zeus/Jupiter. Zeus's symbol was the Bull, and Antipas was killed in the Bronze Bull at that Altar. Lucifer was a Cherubim, described as having 4 faces, one was an Ox. Look at all the gods with Bull like features or associated with horns, Re/Ra Ptah, Hathor, Buchis, Montu-shown, Quarnaim, Enlil, Bel, Marduk, Bal Ammūn,Hadad, Baal Harmon, Iskur, etc. Ba'al was a generic word for lord in addition to being the name of a god. Beelzebub literally means Ba'al Zebub or lord of flies. so your theory isn't far off in that respect. As far as Carthage and the Assyrians practicing child sacrifice for slightly different reasons doesn't detract from it being tied to the same original practice. Look at the different denominations of Christianity in the modern world, each worshiping the same deity in differing ways.